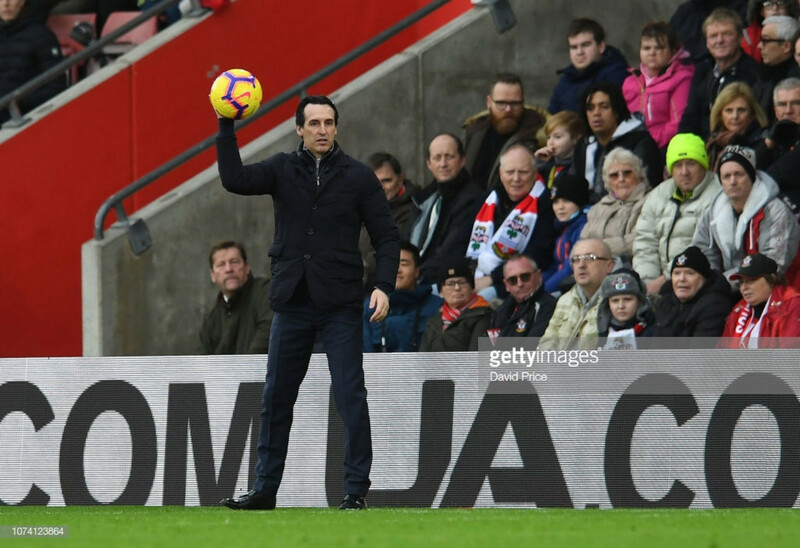 Arsenal boss Unai Emery admits Sunday's shock defeat at Southampton was a 'reality check' for his players but insists the setback has only fuelled their motivation for Wednesday's Carabao Cup quarterfinal against local rivals Spurs. Arsenal twice managed to peg back the Saints after falling behind, but were condemned to a first defeat in 22 games by Charlie Austin's late header. Their hectic December schedule, though, demands that they swiftly put the result behind them. A place in the last four of the League Cup, and an immediate shot at silverware for Emery, is at stake on Wednesday night. The Spaniard has warned opposite number Mauricio Pochettino that his side are now all-the-more determined as they look to return to winning ways. "Sunday for us is a big reality check in our way," he admitted. "We need to improve and also we need to continue doing our way in our process. "It’s not a good result but this reality gives us more motivation to continue to work hard, finding a new thing to work on each day, and also it makes us demand a lot from ourselves in the way we work on this way." Emery is particularly focused on plugging the gaps in Arsenal's defence, which has registered just three clean sheets in seventeen Premier League games. "We can win, we can lose. We’ve won matches playing worse than we did on Sunday. Football is like that. We need to continue improving. "Our analysis shows us it’s the first time we’ve conceded three goals in this process. There’s no excuses because we don’t have a lot of centre backs. "We need to improve by not conceding as many chances to the opposition. A clean sheet is very important in each match. Tomorrow is the next. "A scoring moment is very important and we are second for that in the Premier League. But we need to do better in our balance defensively, and our hard work now is this." There may have been a temptation to rest a number of key players in this cup tie to guard against fatigue over the festive period. But while Emery is willing to back some of his youngsters, he has dismissed the idea of fielding a second-string eleven. "Our first idea is that we play with the best players that we can use tomorrow in this derby. The opposition is very big and it’s demanding a big performance from us tomorrow. "We can use some young players because we think with a big performance, they can help us win tomorrow." Emery was asked if Spurs will be even more motivated for this meeting after they were dealt a beating on their last visit to The Emirates at the start of December. His team's approach, he says, will stay the same. The emphasis will be on respecting the opposition and warding off any complacency. "I say to them that in every match, we need to respect the opposition. Against Southampton, against Tottenham, against Manchester United, against Huddersfield, it’s the same. "This respect is by playing with a big motivation and a lot of excitement to win against them. We must respect this emotion in every moment.